George W. Bush administration coming to power had a notable affect on the US NMD deployment plans. Unlike Democrats, Republicans appeared to give the antimissile shield development a nearly principal political priority. NMD deployment became a hot topic in the media. However, by Fall 2001 Bush administration had not yet decided on the shape of the prospective missile defense system. It is only clear that the system will include not only land-based interceptors that Clinton administration planned to deploy on continental US, but also sea- and air-based antimissiles, and possibly space-based ones. The Pentagon plans to conduct an intensive test program, the results to be used to finalize the shape of the system. US attitude towards the 1972 ABM treaty changed as well. Clinton administration tried to convince Russia that the ABM treaty had to be modified so that to allow deployment of limited NMD. The new administration denies any limitation on the prospective missile defense system, and fails to see any need to preserve the ABM treaty in general. The dialogue with Russia on the future of the ABM treaty that Clinton administration started, was in fact cut off before May 2001, when the parties began intensive consultations. 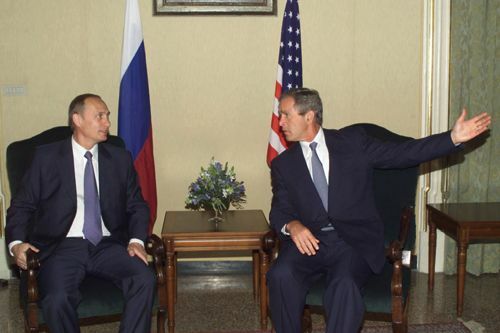 Speeches of the US and Russia's presidents in Ljubljana in June and in Genoa in July, 2001. During Genoa Summit the parties signed Joint Statement On Upcoming Consultations On Strategic Issues that was drafted in order to promote constructive dialogue between the two countries on nuclear arms reductions and ABM treaty issues between two countries. The US position at the consultations called for "move beyond the constraints of the ABM treaty -- a relic of the Cold War" and to approach the issues of strategic stability within the framework of a new partnership relations. Russian official attitude remained unchanged. Moscow considered the 1972 ABM Treaty as a cornerstone of strategic stability and a centerpiece of the whole system of arms control treaties. As an alternative to the US NMD, Russia put forward a proposal on development of a joint European missile defenses and a global missile technology control regime. However, recognizing the Russian initiatives as expedient, US at the same time considered them as a potential addition only to NMD, not the substitution. Tragic events of September 11, 2001 had a crucial impact on U.S.-Russian dialog on ballistic missile defenses. Though Bush administration became even more devoted to NMD deployment, an efficient cooperation of two countries in a campaign against terrorism and a prospect of getting some economic benefits for Russia objectively contributed to achieving a compromise. As a result, on December 14, 2001 President Bush announced, that the U.S. gave a formal notice on unilateral withdrawal from the 1972 Anti Ballistic Missile treaty. Moscow's reaction was very quiet. The Russian President did call it a mistaken move, however he ruled out any agressive reaction in response. According to some comments in the Russian press, a "soft" variant of withdrawal from the Treaty was fixed between two sides well beforehand. The United States promised that they would negotiate a new arms reductions agreement including inspection and verification measures, as the Russian side insisted. Russian experts are divided on the issue of U.S. withdrawal from the Treaty and how Russia should respond. Many of them suggest that Russia should use the existing dialogue in order to secure certain concessions over other issues in exchange for Russia's modest response. Others stay conservative. They believe that Russia should reconsider its attitude towards nuclear arms control treaties and nuclear reduction plans. This page is going to be updated, as the debate continues. The discussion retrospective can be found in the section: ABM Treaty Modification: Should Russia Agree? News and events | Official documents on the 1972 ABM Treaty at the ACDA Archive | "Vardo Radar: Unfriendly Gesture Or A Violation Of the ABM Treaty?" Balance of Strategic Offensive and Defensive Weapons at New Conditions. Future of Arms Control in the Process of Arms Reductions, - in Russian, (by Nikolay Lysenko, Director of the Department of Security and Disarmament of the Russian Ministry of Foreign Affairs, a lecture presented on February 28, 2002 at Moscow Institute of Physics and Technology for the course "Strategic Arms and Problems of Security"
© Center for Arms Control, Energy and Environmental Studies, MIPT, 2001-2002.